Did you know that more than one billion women are still excluded from formal financial services? The 2014 and 2017 Global Findex indicates there is an average 9% gender gap in access to bank accounts across developing economies. In some regions, this figure is far higher. This gender gap has remained unchanged since 2011 despite overall progress towards financial inclusion. As a result, AFI members committed to the Denarau Action Plan (DAP) to increase women’s access to quality and affordable financial services globally — bridging the financial inclusion gender gap. The Denarau Action Plan targets to accelerate the progress of women's financial inclusion by halving the financial inclusion gender gap across AFI member jurisdictions by 2021. Taking the opportunity at the 2017 AFI Global Policy Forum (GPF) held in Sharm el Sheikh, Egypt, the Gender and Women's Financial Inclusion Committee (GWFIC) called on AFI members to halve the gender gap in each of their countries by 2021 — setting specific targets on gender diversity and women’s financial inclusion, in line with the Maya Declaration. Part of the AFI Board of Directors, the GWFIC provides leadership on advancing and promoting women’s financial inclusion in the AFI Network. Committee members are: Bank of Zambia, Central Bank of Egypt, Central Bank of Lesotho, National Bank of Rwanda, National Bank of Cambodia and Banco Central de Reserva de El Salvador. The Denarau Action Plan contributes to women’s economic empowerment and the United Nations’ Sustainable Development Goals (SDG) specifically Goal 5 — Gender Equality. What does it mean for women to have access to finance? "It is my hope that within five years — if not totally eradicated — the gender gap would have been significantly diminished." Members of The AFI Gender and Women’s Financial Inclusion Committee share their thoughts on gender challenges and their ambitions for the future. Watch the video interviews below for more insights. 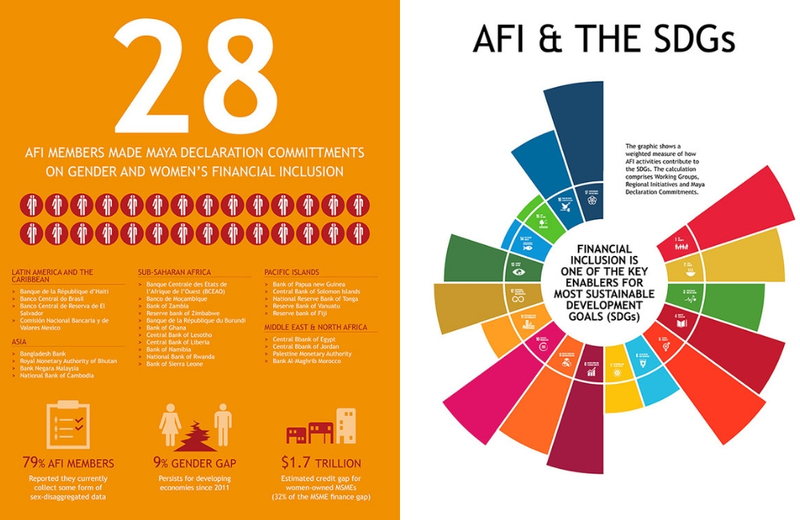 Our brand new toolkit helps AFI member institutions in promoting and sharing their work on gender and women’s financial inclusion. Explore the toolkit for more in-depth insights, or use the shorter version in slide share format for quicker reference. To mark International Women's Day, we asked the AFI network and one of our partners to share their perspective on advancing women's economic empowerment. Take a look at our top reads below. From brochures to blog posts, take your pick below and learn more about the Denarau Action Plan (DAP), and AFI’s work on gender and financial inclusion. Also, take a look at 3 quick & helpful reflections on DAP.